Google, Microsoft, Facebook, Apple, and YouTube – these brands all have something in common, and it’s more than all being luminaries of the tech industry. 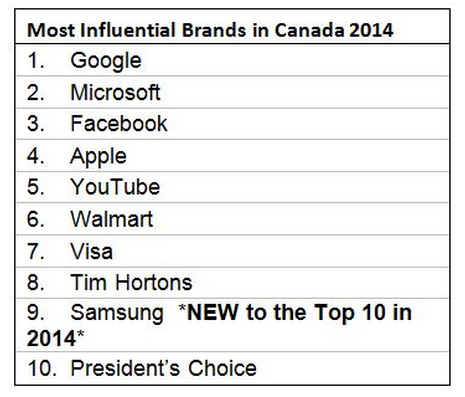 These were the most influential brands in Canada in 2014, in descending order, according to a new survey from the Institute of Communication Agencies (ICA) and Ipsos Reid, which was released on Tuesday during Toronto’s Advertising and Marketing Week. Among the most notable points of the survey? For the third year in a row, Google has snagged the top spot, and six of the top 10 brands hail from tech, digital media, and social media. On Tuesday, the ICA and Ipsos Reid unveiled their survey, which they created by polling about 5,700 Canadian adults online, with the goal of gauging respondents’ perceptions about the brands. To measure “influence,” which can be a pretty vague term, pollsters weighed five different factors – corporate citizenship, engagement, leading edge, presence, and trustworthiness. (Image: Institute of Communication Agencies and Ipsos Reid). And while Netflix, Twitter, and LG weren’t able to crack the top 10, they did get special mention within the survey, as they managed to pull down much higher scores in influence than in 2013. So why did these brands get rated so highly? Aside from brand recognition, these particular brands have a lot of appeal among millennials, who tend to care a lot about tech and social media. Millennials are also heavily in favour of Tim Hortons, especially in Ontario, in part due to Tim Hortons’ association with all things Canadian. Still, it’s typically Boomers who care the most about shopping with brands that are rooted here in Canada. Among members of that generation, four of the top 10 most influential brands were actually Canadian, according to the survey. As part of the survey, Ipsos Reid also polled respondents in other countries, reaching consumers in 20 different countries, including the U.S., the U.K., Mexico, Brazil, China, Australia, and countries in the European region. The study reached more than 33,000 people overall.